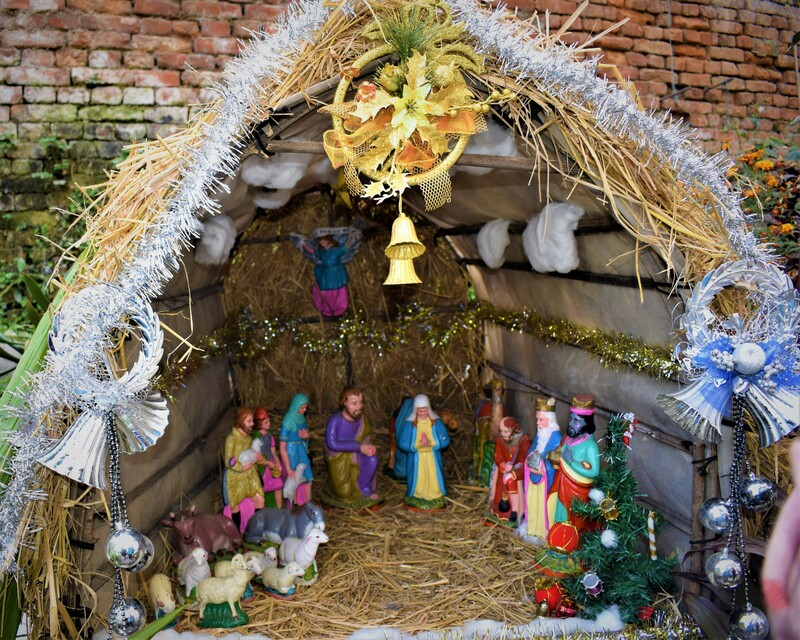 Every year Christmas is celebrated commemorating the birth of Jesus Christ, observed primarily on December 25 as a religious and cultural celebration among billions of people around the world. 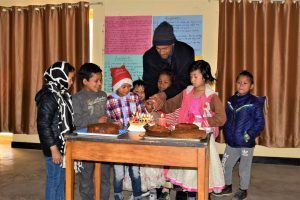 Nepal Jesuit Social Institute planned to celebrate the occasion by inviting special children from Social Service Center and Aruna Bhawan. 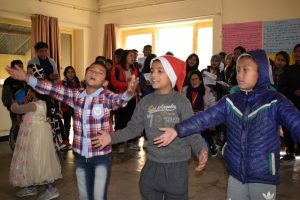 On Christmas eve, short and full of entertainment program was conducted for the children. The day started with decoration of Christmas tree and Crib. The special children performed carol and received gift from NJSI. They also danced and sang song. A special surprise for our Director of NJSI was planned and soon after carol, team celebrated his birthday by cutting cake. Later, children watched some dance videos until the food was ready. Finally everyone enjoyed delicious food and the celebration was over. The children were very happy and dancing all around. These charming angels made the day more special. Each of us enjoyed the day to the fullest as it was a double celebration. Smile was constant. It was a beautiful day indeed. Shree Mahendra Ratna Basic School is located at Gangajamuna rural municipality ward no. 7, Budhathum, Dhading. After massive earthquake, school was destructed and students had to study in a Temporary Learning Center. After evaluating needs of the school, NJSI made 4 classroom building and provided well-furnished furniture to the school. On 21st December, 2018 team of NJSI went to the site for handover ceremony. 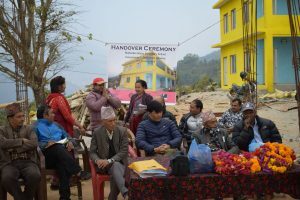 The program took place in the presence of Chairman of the ward, Mr. Menn Adhikari and a representative from education and sports ministry, Mr. Babu Krishna Shrestha. It was long yet successful program followed by unique song dance and parade by students. Social audit was also done on the occasion of handover ceremony among all the beneficiaries. Everyone was satisfied by the construction of the building. 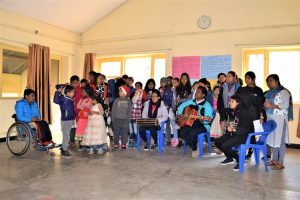 Pitam Dahal, teacher of the school stated that the students were facing difficulty in Temporary Learning Center (TLC) as they were staying in a very congested manner and weather wise also it was not favorable to the students. They were happy and grateful towards NJSI for constructing a well-furnished building. 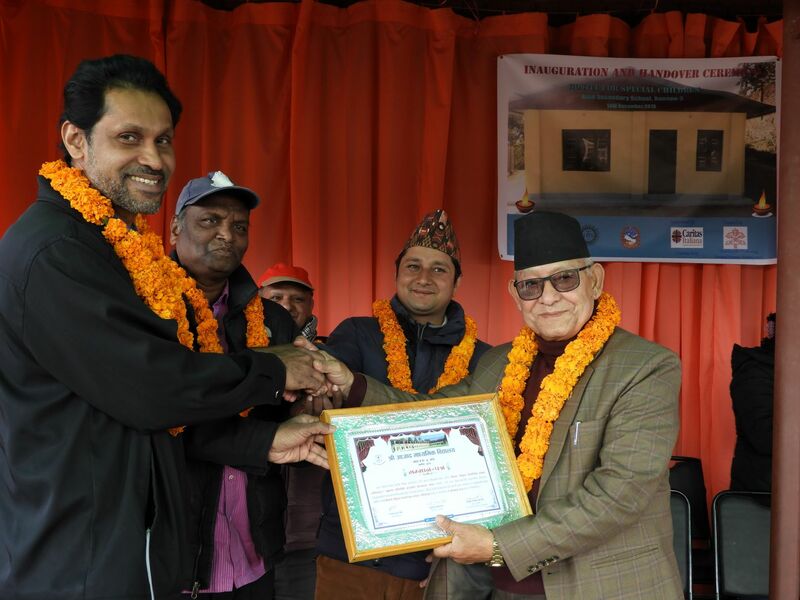 Nepal Jesuit Social Institute has always taken education as a major tool to create a better society and has been working to enhance the quality of education in the rural communities by constructing school buildings and providing necessary educational materials. A need assessment is done before providing the materials. On 27th October 2018, NJSI team went to Shree Saraswati Secondary School and Janachetana Basic School of Sindhupalchowk district to know the gap between current conditions and desired conditions as a need assessment. In Shree Saraswati Secondary School, classes run from Nursery to ten with 180 students and in Janachetana Basic School classes are from ECD to 3rd standard with 31 students. The need assessment started with an interview with Gyanendra Kumar Nepal, Principal of Shree Saraswati Secondary School. The interview helped to know more about the school and rank their necessity. Interaction with students were also done which helped in analyzing the condition of the school as well as students. After that, the team went for second assessment at Janachetana Basic School. 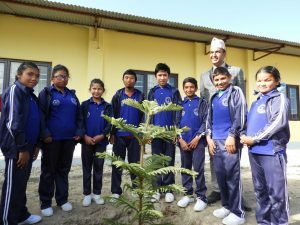 There also the principal of the school, Deuti Neupane was interviewed. Everyone especially the students were open to interact and answer. The principals of both the schools including the staffs and students were grateful to NJSI for providing a hope to the betterment of the school. The hope for the support in future made the school motivated to progress in their education. Azad Secondary School is located at Banepa, Kavre in which 10 students from Sanjeevani School for Deaf and Dumb reside at a small room which is partitioned into four sections consisting kitchen with a small dining table and 3 rooms, cramped with beds and boxes of the students in which they barely had space to stay and study properly. A new hostel with larger room and studying area was built by NJSI. On 14th of December 2018, an official handover ceremony of the hostel in the presence of the beneficiary students, their parents, Azad school students, and govt. officials and teaching staff was conducted. The event continued with speeches from the chairperson of the program, SMC chairperson, Mayor, Fr. Roy, Fr. Arul, the Principal and a guardian. One of the student also expressed vote of thanks using sign language which was pretty impressive. At last the mayor cut the ribbon and NJSI handed over the keys to the school management committee. The best part of the event was two deaf children dancing on an audible song. They learnt the dance step using sign language. The Students were very happy to have a new hostel and so were the teachers. In their previous hostel, they did not have a good place. They barely had space to move around. But now, after getting a new huge space to live and perform their daily activities, they promised that they will take care of it. Even all the guests who visited the hostel shared their appreciative words towards NJSI. 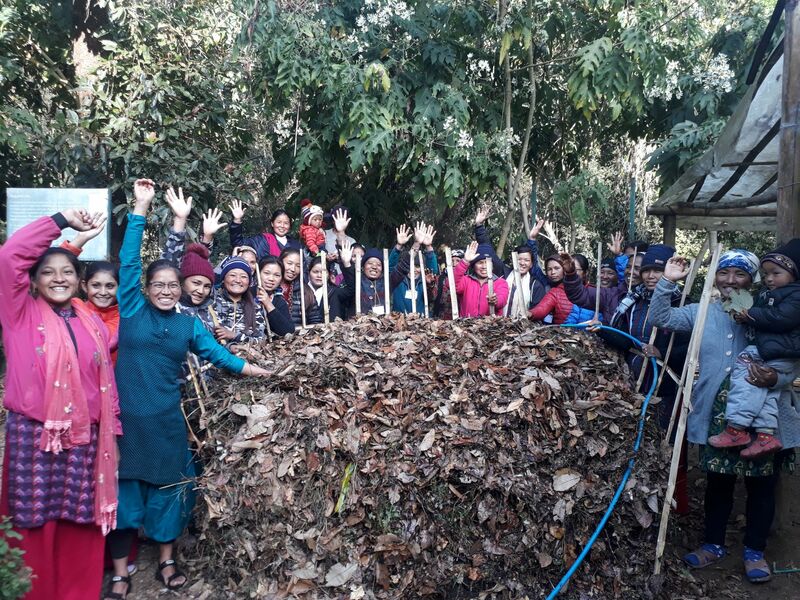 A batch of 24 people from Tipling, Dhading gathered in Kathmandu on 10th and 11th December 2018 for agricultural training on composting, greenhouse making and improve cooking stove construction. Enhancing the livelihood of people by improving agriculture techniques was the motive of NJSI. The event took place at Knowledge Park at Godavari, Lalitpur with two resource persons from ICIMOD. On the first day, two methods of making compost: Enclosed composting and Pit Composting were taught. 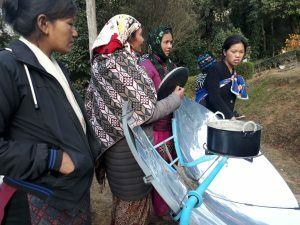 On the second, the participants learnt to make improved cooking stove. They were showed how a stove is made from the bottom level. The stove is claimed to have 60% reduction on fuel consumption and 26% increased efficiency. Participants also assisted in making it. On the visit to Knowledge Park, they saw different adaptable projects like: Spotted Mushroom Farming, Private Hydropower, 3D Farming, Basket Farming, Solar Heating and Cooking method and Terrace Farming. They showed team work while making the compost and participated enthusiastically in every activities. The program ended with certificate distribution. The participants responded positively and they were responsive throughout the training. They were making promises that they will start using the learnt technique soon after they reach the village. 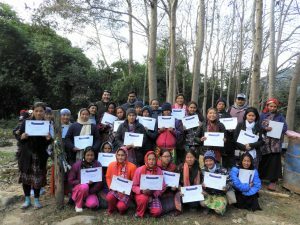 Happiness was seen in their faces as they get to learn new things for improving their lifestyle. NJSI has been organizing Personal Development Camp in different schools to help the students identify their potential and encourage them to be mindful of self and community through promotion of critical thinking and also to establish Eco-club with the student representatives of the school. On 3rd and 4th December, the sixth PDC of 2018 was conducted in Shree Bachchhaladevi Secondary School. This government school is situated at Satyadevi, Dhading with majority of students belonging to Tamang community. A total of 80 students participated in the program who were further divided into 10 groups. 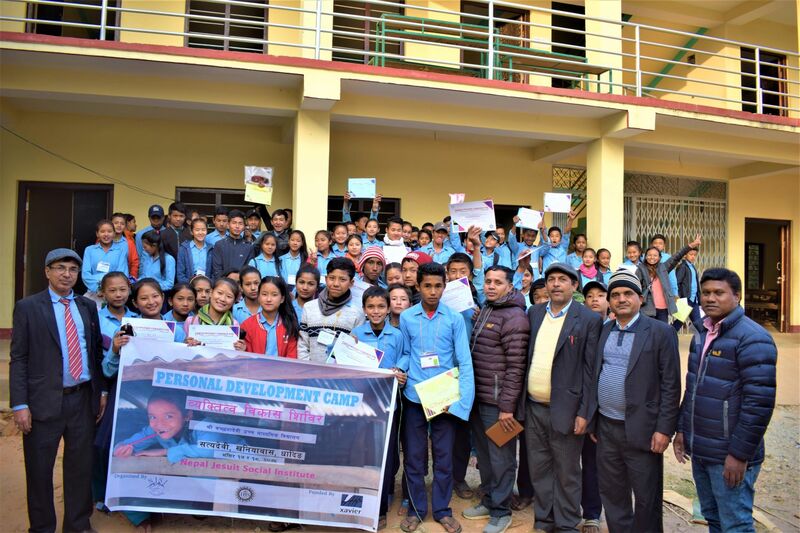 Students of Grade 8 gathered for two days long Personal Development Camp (PDC) with an aim to be aware of their strengths, weaknesses and gain information on education system in Nepal and scholarships available for various studies both nationally and internationally. The presentation and group activities attracted the interest of the students. The eco-club formation was followed with School Cleaning Competition where groups were asked to collect maximum amount of waste around the school compound. The motivation of students in the program as well as to attend school regularly impressed the team. Despite of space constraint, students were active during critical thinking session as well as eco- club formation. The program ended with certificate, gifts and prize distribution. The students were not shy to interact. We also had support of the school administration and teachers. The teachers were motivated to teach and also joined some of the programs for different sessions. The students’ responses were positive in terms of their views and understanding of their aspirations in life and the scholarships available. They were happy to acquire knowledge on these important topics which are not in their course books.